Another easy, tasty side dish, made in the same way as Cabbage Palya, this is beans and carrot palya. There are two secrets to a winning palya made out of beans. First, use good quality haricot beans (also called French beans) instead of the normal lighter green, more woody generic beans. Second, chop the beans as tiny and as uniformly as you can and then lightly steam (to cook while retaining the deep green colour) before stir frying until glossy and cooked. With this recipe and the Cabbage Palya recipe in your repertoire, you are all set to experiment with your choice and combination of vegetables. I sometimes make cooked beetroot palya, as well as cabbage and peas palya—using the same recipe. The traditional palya in Udupi cooking usually calls for adding a dash of sugar while cooking, but I skip this and it still tastes pretty good. Adding carrots or peas to your palya, even if just a little bit will give you a hint of sweetness that will balance your dish without the need for sugar or sweetener. The recipe below calls for byadgi chillies – do refer to the Cabbage Palya post for more on where to find and how to use these kind of chilles. This recipe is suitable for diabetics, weight watchers, and vegetable appreciators! Chop the veggies super tiny and you can actually skip the steaming step and just add a little water while stir frying so that the veggies cook in the pan itself. 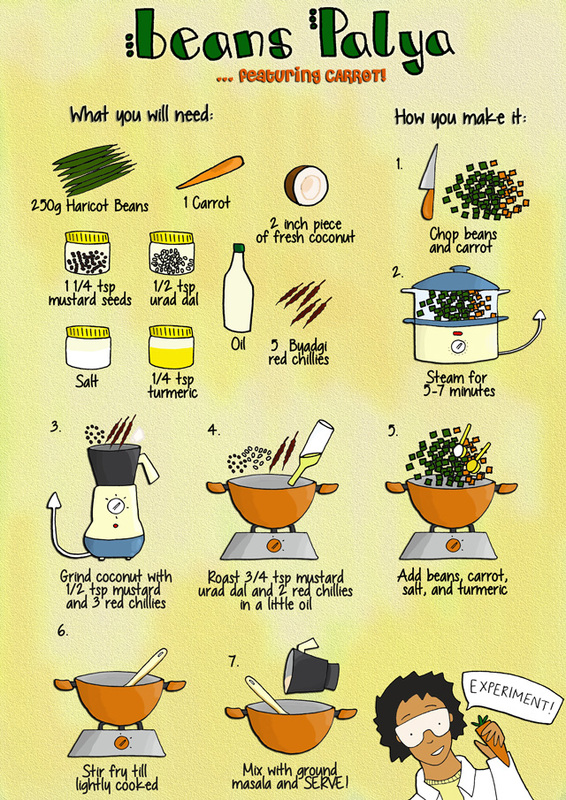 I can honestly say I have never eaten beans this way – what a fabulous dish!! Thanks Afra! It’s a typically south Indian way of eating beans! Yummy lovvve it so much! Reblogged this on Find Moroccan Details. 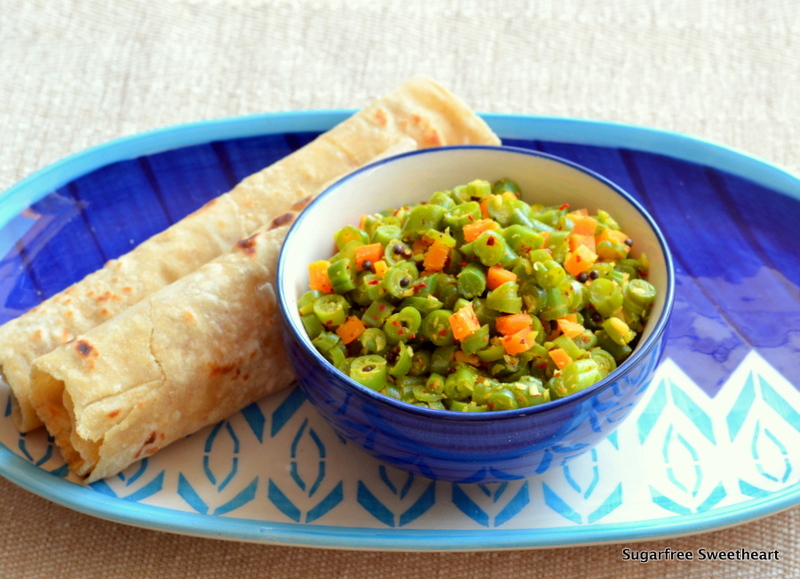 I am huge fan of this veggie side, make it atleast once a week. And i love that blue bowl. An elegant presentation of a simple dish with dashing tableware! I like the name you have given the dish! Featuring carrot indeed. We make this often at home and I absolutely love it! This is awesome and so colorful Priya. An excellent experiment of it was :). I have fallen in love with the bowl and platter .